Make this tall brownie pie for dessert tonight! 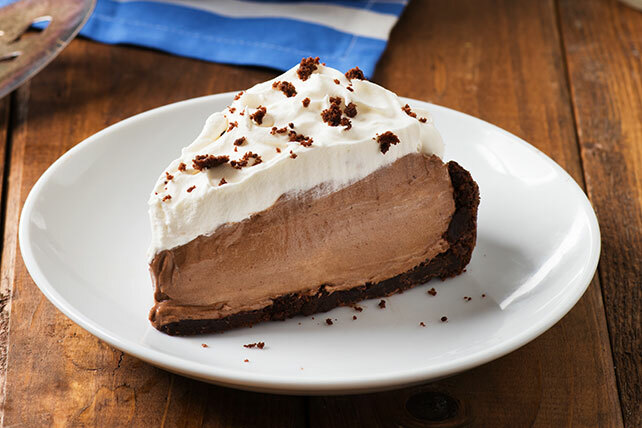 Fudge brownies, pudding and whipped topping dreaminess make our Mile-High Fudge Brownie Pie delicious. Microwave chocolate and butter in large microwaveable bowl on HIGH 2 min. or until butter is melted; stir until chocolate is completely melted. Add sugar; mix well. Blend in eggs and vanilla. Stir in flour until blended. Spread onto bottom of 9-inch pie plate sprayed with cooking spray. Bake 30 min. or until toothpick inserted in center comes out clean. Cool completely. Scoop out center of brownie with spoon, leaving thin layer on bottom and 1/2-inch-thick rim around edge. Reserve removed brownie pieces for later use. Beat pudding mixes and milk in large bowl with whisk 2 min. (Pudding will be thick.) Stir in half the COOL WHIP and all but 1/2 cup of the reserved brownie pieces. Spoon into brownie crust; top with remaining COOL WHIP and reserved brownie pieces. Since this indulgent special-occasion dessert serves 10, it's the perfect dessert to serve at your next large gathering of friends and/or family. Prepare using COOL WHIP Extra Creamy Whipped Topping. Brownie can be baked up to 24 hours before using to assemble dessert. Cool completely, then cover with foil. Store at room temperature until ready to use. Use 1 pkg. (3.9 oz.) JELL-O SIMPLY GOOD Chocolate Flavor Pudding.